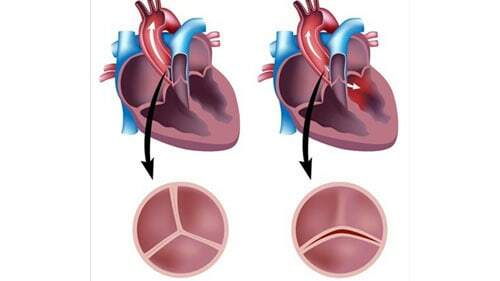 Tricuspid valve stenosis is a dysfunction where the valve opening becomes narrowed and restricts the flow of blood between the lower and upper parts of the right side of the heart or between the right ventricle and right atrium. Without treatment, the right atrium can become so large that the flow of blood passing through the narrow tricuspid valve becomes partially blocked. The condition can also cause shrinkage of the right ventricle because of the reduction of blood that enters the right atrium. This condition is rarely inherited. This valvular abnormality is uncommon but usually occurs in individual suffering from rheumatic heart disease, rheumatic fever, and tricuspid regurgitation. In some cases, the right atrial becomes distended and hypertrophied causing heart failure due to right heart failure without dysfunction of the right ventricle. In some instances, the individual will suffer atrial fibrillation as a result of tricuspid valve stenosis. The more stenotic the tricuspid valve becomes, the more difficult it is for blood flow into the right ventricle from the right atrium. As a result, pools of blood form in the atrium causing it to enlarge. This occurs when the ventricle restricts the amount of blood causing it to shrink and eventually reduces the heart's ability to pump blood. Who Is at Risk for Tricuspid Valve Stenosis? Individuals most at risk of tricuspid valve stenosis or those who contracted rheumatic fever when they were young. In some rare cases, tricuspid valve stenosis is the result of connective tissue disease or a tumor affecting the valve. Only a small percentage of individuals have an inherited condition referred to as congenital tricuspid valve stenosis. The condition is not caused by a virus or bacteria so it cannot be transferred between individuals and is not affected by family history. What Causes Tricuspid Valve Stenosis? The dysfunction of the tricuspid valve is due to stenosis is caused by an alteration in the valve that creates an adequate function of the valve's leaflets. Typically, the disease is caused by rheumatic fever and is almost always associated with aortic valve and mitral valve involvement. The tricuspid valve leaflets become chlorotic and thickened which causes them to shorten in size. At this point, the valve is restricted and hampers the flow of blood into the right ventricle causing problems with the pulmonary vascular system. Some rare cases involve congenital tricuspid stenosis where there is a deformity in the valve leaflets, usually causing a cardiac anomaly. Most of the symptoms occurring with tricuspid valve stenosis are rarely severe enough that surgical repair or replacement of the valve is required. In some cases, the patient experiences peripheral edema and hepatic congestion. Accurately diagnosing tricuspid valve stenosis can be difficult. During auscultation, when the doctor is listening to the chest with a stethoscope, tricuspid stenosis is often hard to detect. The malfunctioning valve may produce a soft snap or rumble. Continuous listening might be able to differentiate a murmur that becomes louder and last longer when the legs are raised, a breath is taken, or upon physical exertion. ECG (electrocardiogram) can reveal an enlargement of the right atrium and hypertrophic of the right ventricle to verify a defect, malformation or stenosis of the valve. Chest X-Ray can reveal an enlarged right atrium and dilated superior vena cava that usually indicates that the right side of the heart has become enlarged. Liver Enzymes Test – This test can reveal elevated levels of liver enzymes caused by passive hepatic congestion. TEE (transesophageal echocardiography) – This test involves inserting a device down the throat to capture images of the heart in action. Cardiac Catheterization – This procedure is rarely used to diagnose tricuspid valve stenosis. However, the procedure is performed by threading a catheter into the heart from the groin to detect elevated right atrium pressure. The treatment of the patient will receive for their tricuspid valve stenosis is dependent on the damage that has been caused by the disease and how far it has progressed. The doctor might recommend medical management, surgical management, endocarditis prevention, or another remedy. Medical Management – The doctor will monitor the disease's progress with routine appointments. The progression of the disease can likely be determined during examinations that are spaced a year apart or less often. The doctor will perform a medical examination and order diagnostic tests at regular intervals. Possibly, the patient will receive one or more prescription medications for treating the symptoms, irregular heart rhythms (arrhythmias) and heart failure. Surgical Management – The only option of an effective treatment might be a tricuspid valve repair if the diseases severe. The valve might be repairable using an annual plastic ring to manage tricuspid regurgitation or blood]. Endocarditis Prevention – Many individuals who develop tricuspid valve disease also develop endocarditis, a serious infection where the heart valves are significantly damaged and require a replacement or repair through a surgical procedure. Doctor and Dentist Visits – When visiting a doctor or dentist, individuals with valve disease must carry a card containing essential information about their condition to minimize any dangers associated with a procedure the doctor or dentist might be performing. Symptoms of an Infection – At the first sign of infection, it is essential to call the doctor to describe general body achiness, sore throats or fevers. Infections could cause significant damage to the heart valve. Fortunately, endocarditis is not caused by the flu or common cold. Taking Antibiotics – It is essential to take a regimen dose of antibiotics before undergoing any procedure that could cause bleeding. This could include invasive test, dental work, teeth cleaning, or minor and major surgery. Optimal Dental Hygiene – It is essential to take proper care of the gums and teeth as a way to prevent infections. This requires routine dental visits. Before taking antibiotics, it is important to talk to the doctor in charge of your new valve or your tricuspid valve stenosis condition. All discussions should include a surgeon or cardiologist who specializes in diagnosing and treating valve diseases.